Besides, it's beautiful, isn't it?!?! 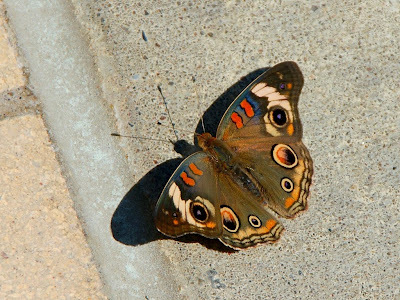 The buckeye butterfly is beautiful, but I'm really looking forward to the bat photos! Wow...what a beautiful butterfly. Nice capture. Isn't it great when our passion is acknowledged and accepted? Even better when we get tips on possible great captures. Wonderful photo. I envy you your nice colleague. Great photo of the common buckeye! I've seen a lot of them here this summer too. Can't wait to see the bat photos. What a beautiful butterfly. I have never seen a Buckeye except in photos. I took a photo of a bald-headed Blue Jay this week. Have a great weekend Misty. Exceptionally beautiful, Misty! I seldom see this species, but they are one of my favorites. Lovely patterns on those wings. Wish we had some of those over in Europe. Such pretty wings! Great photo. Gorgeous colour! butterfly will always be gorgeous anyways..Good day! Wow, so beautiful and a wonderful shot of it too. What a lovely butterfly and great shot - thank to you fellow worker! We can't wait for the bat photos! The perfect capture. What a beautiful butterfly. Hey, taking your camera to work with you is a must as capturing this little guy proves. I take my camera everywhere. I don't think I have ever seen a butterfly with such fresh colors before. It is gorgeous. Well captured! what beautiful color! We see loads of monarchs around here. you have people scouting photos for you!! That sure is a beauty! I should be more like you and not post so many photos. I guess my CC is mostly about what critters I've seen in my yard during the week. I have trouble deciding which photos to exclude. I just got my post done and posted. Oh, and I think it's cool you take your camera to work, and, like your husband does at home, your co-worker tells you when there's a critter sighting. It's gorgeous and I like the shadow too. That is a beautiful butterfly. Last year we had no butterflies at my house this year there seems to be hundred but none with those markings.